Best practices include: Always use barbless hooks. When fishing with bait, use circle hooks. Minimize handling all fish; slime and scales can be easily damaged and removed with excessive handling, thereby greatly increasing risks of infection. If a bonefish loses equilibrium after you land it, revive it until it can swim upright, then shorten the fight time on future fish. 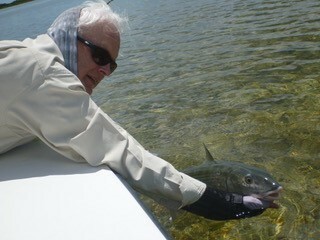 More on proper catch and release can be found at the Bonefish & Tarpon Trust. Previous post: Great Day at the Range!